Injury is common in running and seen to impact up to 94% of recreational runners. Clinicians often use alterations from normal musculoskeletal clinical assessments to assess for risk of injury, but it is unclear if these assessments are associated with future injury. To identify alterations in muscle strength, flexibility, range of motion, and alignment that may predict lower extremity injury in runners. Articles were selected following a comprehensive search of PubMed, Embase, CINAHL, and SPORTDiscus from database inception to May 2018. Included articles were prospective cohort studies, which specifically analyzed musculoskeletal impairments associated with future running-related injury. Two authors extracted study data, assessed the methodological quality of each study using the Critical Appraisal Tool and assessed the overall quality using the GRADE approach. Seven articles met the inclusion criteria. There was very low quality of evidence for the 7 identified clinical assessment alteration categories. Strong hip abductors were significantly associated with running-related injury in one study. Increased hip external-to-internal rotation strength and decreased hip internal range of motion were protective for running injury, each in one study. Decreased navicular drop in females had a protective effect for running-related injury in one study. Due to very low quality of evidence for each assessment, confounders present within the studies, a limited number of studies, different measurement methods among studies, measurement variability within clinical assessments, inconsistent definitions of injury and runner, different statistical modeling, and study bias, caution is suggested in interpreting these results. Injury in runners is common, affecting 19.4 to 94.4% of runners annually [1, 2]. A high incidence of lower extremity running injuries such as Achilles tendinopathy, anterior and/or lateral knee pain, hamstring injury, stress fractures, or medial tibial stress syndrome, is reported commonly in the scientific literature [1, 3]. Despite widespread research on running injuries and their treatment, there are few long-term strategies or guidelines for preventing injuries in runners . Alterations in objective musculoskeletal clinical assessments that predict whether a runner is at risk of injury might potentially form the basis of long-term prevention strategies. A method for identifying those at risk for future running-related injuries is necessary in clinical or community wellness settings. Recently, researchers have focused on developing models to predict running-related injury (RRI) by examining the interaction of factors such as training related characteristics (i.e. work load)  and acute to chronic workload ratios (i.e. changes in weekly running distance) [6, 7]. Several studies [8–15] have investigated running gait and formally evaluated kinematic and kinetic factors that may predict or differentiate an injured runner from an uninjured runner. However, kinematic measures used in laboratories are not readily transferable to clinical practice, as they require complex equipment such as force plates and motion analysis systems. In practice, clinicians use objective assessments to determine alterations in muscle strength, muscle flexibility, joint range of motion, and alignment during evaluation of runners. Clinicians use results of these tests to explain RRI to patients  as these assessments have been hypothesized to be associated with running injuries [17–19]. They often rely on the results of single studies reporting individual tests as well as studies that use cross sectional designs. To our knowledge, alterations in objective musculoskeletal clinical assessments have not been formally investigated for their ability to predict injury in runners in a systematic review. Therefore, the objective of this review is to identify alterations in muscle strength, flexibility, joint range of motion, and alignment that may predict lower extremity injury in runners in order to improve future statistical modeling for injury risks in runners. Syntheses of clinical assessments’ utility may assist clinicians who commonly use stand-alone findings from single cross-sectional studies to evaluate risk in athletes. This study used the Preferred Reporting Items for Systematic Reviews and Meta-Analyses (PRISMA) statement during the search and reporting phase of this systematic review . The systematic review was also registered with PROSPERO International prospective register of systematic reviews (CRD42016020087). 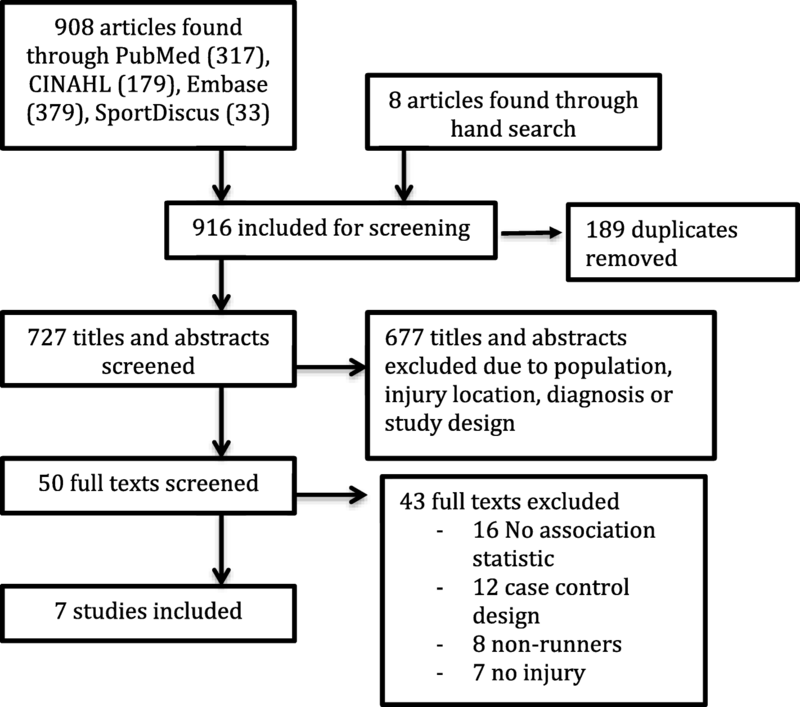 PubMed, Cumulative Index of Nursing and Allied Health Literature (CINAHL), Embase, and SPORTDiscus databases were searched in consultation with a biomedical librarian to identify studies reporting the use of objective musculoskeletal clinical assessments predicting lower extremity injury in runners from database inception to May 2018. Keywords and standardized vocabulary (e.g. medical subject headings (MeSH) for PubMed) were combined with Boolean operators to build the searches. The search terms for PubMed are included in Appendix 1. The searches for CINAHL, Embase, and SPORTDiscus were built from the PubMed search using controlled vocabulary for each database. A detailed hand search involving references from the selected articles and gray literature was conducted, as computerized searches can occasionally omit relevant articles. Searches were limited to humans. We included only prospective cohort studies with longitudinal designs examining the relationship between musculoskeletal clinical assessments of the lower extremity assessed in a baseline cohort of runners who were uninjured and were followed over time to identify occurrence of an RRI. This inclusion criteria assisted our aim of predictive modeling, as the included studies “predict the output value for new observations given their input value” . We only included studies that reported on strength of association (i.e., odds, hazard, or risks ratios in either bivariable or multivariable models) to assist predictive modelling. Odds ratio is used to compare the odds of an outcome when exposed to the variable of interest , hazard ratio measures the risk of complication given different event rates , and risk ratio measures risk of an event happening in one group compared to another group . Running-related injury was operationally-defined in this review by at least one of the following: 1) diagnosed by a medical physician, athletic trainer or physical therapist, 2) presence of pain with duration of symptoms > 24 h, 3) decreased running mileage, or 4) missed workouts. Lower extremity was defined as any anatomic structure caudal to the lumbar spine. Included studies had to report on RRI. We excluded studies that did not mention clinical assessments, as well as studies using 3D analysis (camera/video) for interpretation. We excluded studies investigating 3D running kinematics (3D biomechanical risk factors) as this review focused on factors evaluated by clinicians. Due to time and expense, 3D is not regularly used by clinicians. We also excluded 2D video analysis as the validity and reliability of this evaluative method is still being established and the focus of this review was objective assessments that are frequently used by clinicians [25–27]. We also excluded military studies as the running conditions (e.g. footwear, carrying load, clothing) are usually different from recreational or competitive runners that would be seen in a community-based setting. Our inclusion criteria allowed for a variety of runner characteristics and follow-up points. Two authors (SC and JM) reviewed abstracts and selected full text articles independently. Disagreements on whether to include an article were resolved by consulting a third author (CC). Data regarding study population (e.g., gender), definition of injury, clinical assessment measure investigated, strength of association statistics, methodological quality of studies and overall quality of the evidence were extracted from full text articles by one reviewer (SC), and confirmed by a second reviewer (JM). Included studies presented all needed data in the manuscript; therefore, no authors were contacted for further information. Included full text articles were each assessed independently by two authors (SC and JM) using the Critical Appraisal Tool (CAT), adapted form of the Critical Appraisal Form for Quantitative Studies to evaluate the methodological quality of the selected papers [28, 29]. This tool was chosen because a similar study investigating biomechanical risk factors in runners with defined injuries also used the adapted CAT . The tool is designed to evaluate study quality based on the sample, measures, methods, and outcomes. Items that met criteria, ‘+’, were added to the total score, with the best quality score of 16. A CAT score of > 75% was deemed good quality, 50–75% moderate quality, and lower than 50% poor quality . To evaluate the overall quality of evidence and strength of the findings for of the each clinical assessment alteration category, the GRADE approach (Grading of Recommendations Assessment, Development and Evaluation)  was used. The quality of each specific clinical assessment alteration category (Low or very low, as these were observational studies) was based on the performance of the studies against five domains: Risk of bias (methodological quality of each clinical assessment test alteration) , inconsistency (heterogeneity within assessment test categories) , indirectness (applicability of the findings in terms of population and outcomes) , imprecision (the number of participants and events and width of confidence level for each assessment) , and publication bias (the probability of selective publication) . Initially, before 189 duplicates were removed, the search yielded 916 results (PubMed 317, Embase 379, SPORTDiscus 33, CINAHL 179, and 8 via hand search)(Fig. 1). After the first screening, 50 full-text articles were retrieved. Following a consensus meeting, seven articles were included in this review. Reference checking did not find any additional studies. A Patient, Exposure, Outcomes (PEO) table, which describes attributes of each study (author, population, exposure, and injury definition) is included in Appendix 2. Descriptions of the objective musculoskeletal clinical assessments identified in the included studies and their methods of measurement have been outlined in Appendix 2. The number of runners included in each study sample ranged from 59 to 532. The results of the assessment of quality of each study using the critical appraisal tool are reported in Table 1. Among the seven studies included in this review, per the CAT, two were of good methodological quality (> 75%) [36, 37] and five were of moderate quality (50–75%) [16, 38–41]. The majority of methodological shortcomings were observed in the following items: sample bias (7/7 studies) [16, 36–41], reporting validity of measures (5/7 studies) [16, 38–41], justification of sample size (5/7 studies) [16, 38–41], and reporting reliability of measures (5/7 studies) [16, 38–41]. The included studies in this review were all observational design, and therefore per the GRADE approach were considered of low quality of evidence overall . When evaluating each domain, the clinical assessment alterations categories were downgraded either for imprecision, indirectness, inconsistency or all three, resulting in very low quality evidence for each clinical assessment alteration investigated in this review [33, 34, 42]. Publication bias refers to the probability of selective publishing and due to the limited amount of studies for each the clinical assessment alterations(up to three) this item was not used to downgrade evidence in this review . The results of GRADE are reported in Table 2. Force (N)x resistance moment arm (m)/body mass (kg). Weakest:OR:1.25, 95% C=I 0.2, 9.9. Evidence for hip strength was of very low quality (hip abduction strength downgraded due to indirectness, inconsistency, and imprecision whereas the rest were downgraded due to indirectness and imprecision). Of the two studies investigating hip abduction strength, one study  reported that stronger hip abduction strength was significantly associated with injured runners (OR = 5.35, 95% CI= 1.46, 19.53) whereas the other study  found no significant association. Finnoff et al. , also reported a significant protective association with increased hip external rotation to internal rotation strength ratio RRI (OR = 0.01, 95% CI= < 0.01, 0.44). There were no significant associations between hip adduction, abduction to adduction ratio, external rotation, internal rotation, flexion, extension, flexion-to-extension strength ratio and RRI . Evidence for hip joint range of motion was of very low quality (downgraded due to indirectness and inconsistency). Two studies [36, 40] investigated hip internal and external range of motion, of which one study  found that increased hip internal rotation was protective against RRI in females that developed medial tibial stress syndrome (aOR = 0.91, 95% CI= 0.85, 0.99) . Evidence for hip alignment was of very low quality (Q angle downgraded for indirectness and inconsistency, and leg length downgraded for imprecision). Two studies [16, 40] investigated Q angle and one study  investigated leg length. The studies were unable to find significant relationships between hip alignment tests investigated and RRI. Evidence for hip flexibility was of very low quality (downgraded for indirectness and imprecision). One study  investigated straight leg raise and did not find significant association between straight leg raise test and RRI. Evidence for knee strength was of very low quality (downgraded for indirectness and imprecision). One study  investigated knee strength using a HHD and did not find a significant association between quadriceps strength or hamstring strength and RRI. Evidence for ankle alignment was of very low quality (navicular drop downgraded for indirectness and inconsistency, and foot posture index downgraded for indirectness and imprecision). Three studies [36, 37, 40] investigated navicular drop and the development of running injuries. One study  found a significant protective relationship between decreased navicular drop amount in females and injury (HR = 0.92); two studies did not find a significant relationship between navicular drop and injured runners. One study  investigated the Foot Posture Index  and did not find a significant relationship between foot posture and injured runners. Evidence for ankle range of motion was of very low quality (downgraded for indirectness). One study  investigated ankle dorsiflexion range of motion and did not report a significant association between ankle dorsiflexion (in knee straight and bent) and RRI. The goal of this study was to summarize the results of stand-alone studies that have investigated clinical assessment and risk of injury. Synthesizing the work should improve an understanding of which factors may be transferable to a clinical environment. Stand-alone findings such as increased hip external to internal rotation strength ratio and decreased navicular drop were protective of injury, but only in a few studies. We also found that increased hip abduction strength was predictive of injury and decreased hip internal rotation was protective of injury in runners, largely contradicting clinical thought and results from non-longitudinal studies of association . In no cases did we find compelling evidence from multiple studies of common predictors of injury risk in running. Also, all clinical assessment alteration categories had very low quality of evidence; therefore, clinicians should be very cautious interpreting the results below. As stated, increased hip external to internal strength ratio was seen to be protective for injury in runners that developed patella femoral pain syndrome. This finding was reported in one study by Finnoff et al. Although the authors did not operationally define this ratio, it is assumed that an increase in hip external rotator strength when compared to internal rotator strength would be protective for runners. The hip external rotators muscles control femoral internal rotation and a lack of control may be linked with running injury [45, 46]. It is important to note there were several confounders in this study. The study did not report running distance per week (mileage) nor did it report any injury history, both of which have been associated as risk factors for injury. Because these athletes were high school runners, these factors could have significantly influenced results . Decreased navicular drop was seen to be protective of injury in this review. This finding was reported in one study ; however, it was not significant among the two other studies [25, 28] that did investigate this measure. Excessive pronation of the foot causes tibial rotation and has been seen to be related to medial stress syndrome in runners . This finding was investigated in novice runners participating in a 13-week training program for a 4-mile running event and therefore cannot be applied to all running populations in general. Increased hip abduction strength was found to be predictive of injury in one cohort study. The finding that runners with stronger hip abductors were more associated with RRI may have been due to a number of confounders. The participants included in the study were high school athletes, possibly novice runners. As mentioned before, weekly training mileage and injury history were not reported. Finnoff et al. , theorized that the injured subjects in the group had higher body mass index (BMI), which could have led to higher hip abduction moments. To compensate for these larger moments, the runners may have developed increased hip abductor (eccentric) strength over time . This finding shows that some injured runners may have increased strength, specifically if they are younger or novice runners with a higher BMI. Caution should be used when interpreting this result with all running populations. Decreased hip internal rotation was found to be protective in one cohort study . Excessive hip internal rotation has been associated with injury during jump landing tasks and lack of control of the lower extremity in the frontal and transverse planes has also been hypothesized as a cause for injury in runners [48, 49]. Decreased mobility could therefore be beneficial and protective for runners, as it would require less neuromuscular control. This finding shows that stiffness in runners may not be an impairment as previously thought [50, 51], specifically if they are young and may not have developed the neuromuscular control needed to stabilize the limb. Caution should be used while interpreting the findings of this study as participants were high school runners. Shin pain was the only injury reported. Mileage of the runners was not reported; however, frequency of training was. Experience was noted as national, state, or entry level, however no history of running injury or amount of running miles was reported. The GRADE level of evidence quality was very low for all objective assessment alteration categories included in this review. Studies were downgraded for either indirectness, inconsistency, imprecision or all three. There were no common predictors across a number of studies in this review. There may be several reasons for the lack of commonality or the occasional findings that are contradictory to clinical thought, such as differences in subject demographics, different measurement methods, measurement variability within clinical assessments, inconsistent definitions of injury and runner, different statistical models, and study bias. These issues have been further addressed below. There were a wide range of different assessments used to compare clinical assessment alterations and future injury within the seven prospective studies, and studies used different methods when measuring the same construct. For example, ankle alignment was measured with navicular drop [36, 37, 40] or Foot Posture Index . This lack of homogeneity between studies resulted in difficulties comparing clinical assessments between studies, even when studies focused on a similar construct (e.g., alignment). A variety of methods was used to define and report the clinical assessments, even when the same testing device was used. For instance, weakness in hip HHD assessment was often reported by asymmetry between left and right sides [39, 40]. However, another study  divided strength into three tertiles (weakest, middle and strong) across participants and used the strongest strength values as the comparator. One study  multiplied the HHD reading by the moment arm and then normalized it to the participant’s body mass. The other studies normalized HHD values to body mass and height . This variability in the reporting of muscle strength assessments made it difficult to compare studies, perform meta-analyses, or identify common patterns of muscle strength in included prospective studies. Population and injury definitions were also heterogeneous among studies. Running populations in studies varied from novice to recreational, with more males than females in the Q angle studies [13, 29]. Running related injury has been defined many ways in the literature, as evidenced by the wide variability of injury incidence rates reported in various studies [1, 2, 52]. When defining an injury, studies used: 1) evaluation by a medical physician, athletic trainer or physical therapist , 2) presence of pain with duration of symptoms > 24 h , 3) decrease in running mileage, 4) missed workouts  or, 5) a combination of the variables listed [36, 38, 40, 41] all which were included in our study. Consistent reporting about injury severity, the course of treatment, previous injury, or whether the runner had sought assistance from a health care provider was lacking. Difference in levels of injury severity would likely alter associational modeling and influence the statistical significance of the findings. Lastly, statistical modeling was different among studies. Three studies used a multivariable model, whereas four studies used a bivariable model. Among the three studies that used a multivariable model, measures of independent variables such as age , other clinical tests  and BMI  were also included in the regression analysis model. This could have influenced the relationship between singular clinical test (such as navicular drop)  and RRI. Previous reviews investigating the risk of RRI have also reported similar criticisms [53, 54]. Winter et al. investigated fatigue and RRI, and were unable to find conclusive patterns of associations due to a lack of homogeneity of the runners, small sample sizes, and the distances that were run to determine fatigue. A systematic review studying vertical ground reaction force and injury was also unable to make recommendations due to a lack of prospective studies investigating this variable and its association with injury . When reviewing biomechanical risk factors, Aderem and colleagues  concluded that shod female runners with iliotibial band syndrome (ITBS) may have associated increased peak knee internal rotation and peak hip adduction during stance (based on one prospective cohort study), but because of limitations in effect size and the number of studies and methods, the authors did not make any additional recommendations. In the one review that investigated alterations to the musculoskeletal system, similar to the current study, i.e., plantar pressures, the authors concluded there was inconsistency among studies and suggested improved methodology for future research . There are several limitations to this review. Studies with post-operative populations were excluded from the study, so it is possible the runners included in the selected studies had less severe injuries, which potentially influenced the clinical assessment alterations between baseline and future injury. This was performed to better generalize the results to the population of runners commonly seen in outpatient community-based clinics, who often present without having seen a surgeon . This review suggests that objective assessments that measure alterations in muscle strength, flexibility, alignment, and range of motion of the lower extremity had very low quality of evidence. Within the studies there were several confounders such as participant’s experience, unknown injury history, and unknown weekly running mileage, all of which have been seen to be associated with RRI . Among the studies, there were a limited number of studies investigating each assessment, inconsistent results, different measurement methods among studies, measurement variability within clinical assessments, inconsistent definitions of injury and runner, different statistical modeling, and study bias. Future studies should aim to improve the quality of the studies as well as use standardized assessments and minimize confounders when conducting clinical research to predict injury in runners. The authors would like to thank Leila Ledbetter (biomedical librarian) for her help with the literature search. SMC provided idea, design, writing, review of manuscript and overall content of material; JM provided review of articles and quality tool; SS and CC provided writing, review and overall content of manuscript. All authors read and approved final manuscript. Shefali Christopher has been a sports physical therapist for 10 years. As a clinician, she predominantly treated runners and used musculoskeletal clinical assessments to evaluate and treat injured runners. As part of her PhD, from the University of Newcastle in Australia, she wanted to investigate the utility of the tests she was using and see if they had any predictive capability. Ankle dorsal flexion- measured both with the knee fully extended and flexed to 90° passively, in supine position. Self-reported musculoskeletal pain of the lower extremity or back causing a restriction of running for at least 1 week, i.e. 3 scheduled consecutive training sessions. Alignment: Foot Posture Index . Hip rotation- measured with the hip and knee flexed at 90° in the sitting position; the hip and knee were rotated internally and externally to firm end feel with the angles relative to the initial position. Hulme A, Thompson J, Nielsen RO, Read GJM, Salmon PM. Towards a complex systems approach in sports injury research: simulating running-related injury development with agent-based modelling. Br J Sports Med. 2018. https://doi.org/10.1136/bjsports-2017-098871. [Epub ahead of print] Review. PubMed PMID: 2991512. Ryan R, Hill S. How to GRADE the quality of the evidence. Cochrane Consumers and Communication Group, available at http://cccrg.cochrane.org/author-resources. Version 3.0. December 2016. Accessed 1 Dec 2018.